Photo: Beard Cabin, ca. 1892, 614 East Main Street, Shawnee, OK. 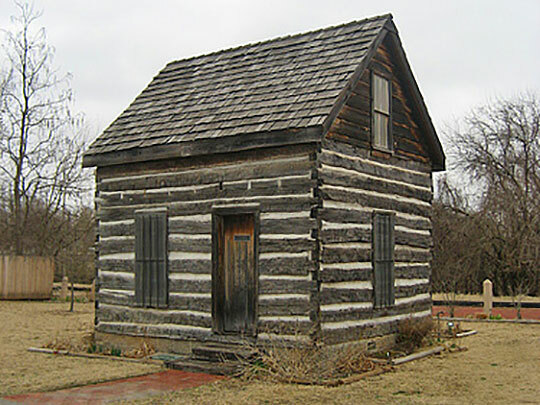 The first house to be built in Shawnee. Restored and moved to its present location in 1999. Listed on the National Register of Historic Places in 1983. Photographed by User:holt9359 (own work), 2008, [cc0-by-1.0 (creativecommons.org/publicdomain/zero/1.0/deed.en], via Wikimedia Commons, accessed August, 2014. The Pottawatomie County courthouse is located at 325 North Broadway, Shawnee, OK 74801; phone: 405-273-3624. During the land run of 1891, Pottawatomie County was organized with Tecumseh as the county seat. In 1892, the voters of the county elected to rename County "B" as Pottawatomie County after the Potawatomi Indians. Shawnee was voted to replace Tecumseh as the county seat in 1930.